Eileen Gunn (WSC '93) is an expert on traveling with children. Before she became a mother, Eileen and her husband were adventure-seekers. But upon starting a family, exploring the world became a little more complicated. 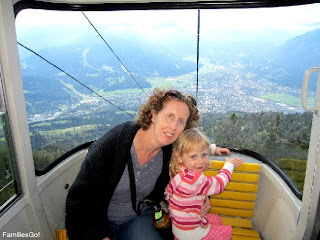 Since then, Eileen has started a website dedicated to helping families travel with children. It's called Families Go!. Today, Eileen offers some interesting advice about traveling with your children (or future children, for you recent grads with a twinkle in your eye). Enjoy. Before my husband and I had our daughter we were fairly adventurous travelers. We kayaked in the Galapagos, went camping in Vietnam, climbed a volcano in Bali in the pitch black to see the sunrise from the top, and drove across Mexico in a VW bug (the old kind). Then our daughter came along. We still wanted to travel, knew things had changed and weren’t sure where to begin. So I did what I always did when I needed parenting information: I turned to the Internet. Most of what I found was clichéd, unhelpful and fairly discouraging. There was too much advice on how to “survive” vacations that revolved entirely around activities only a kid could like, which made me cringe. Surely it was possible to actually enjoy family travel, wasn’t it? Equally unhelpful were the über stylish travel bloggers who bragged about taking their toddlers to 6-course meals at 5-star restaurants. It seemed unrealistic and unkind to force this button-down adult world on our energetic and curious child. There had to be something in between. Most parents I talked to had similar frustrations, so I started the travel content and information website I needed and called it FamiliesGo!. 2. Kids are kids. Even when you are on vacation babies cry, picky eaters are picky, toddlers need to be watched every second and kids of all ages get tired, bored, hungry, crabby and sulky. Having to be always on can make parents feel like they don’t get a vacation. But I find that if you just accept this reality, work with it and show empathy when the traveling gets tough (plane and car rides are long and boring), then it fades into the background and you do find new ways to relax. 3. Kids can surprise you. 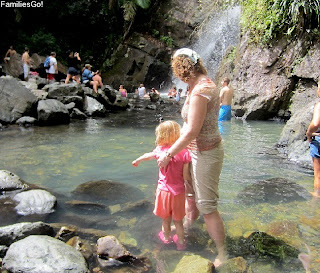 In Puerto Rico this winter we took our daughter to the rain forest and went on what we thought would be an easy ten-minute walk to a waterfall. It turned out to be a half-hour of hilly hiking. Our child, who can’t walk three blocks in the city without claiming she’s tired, scampered along, made up stories, sang songs, picked up sticks, and waded right into the shallower pools when we got to the falls. Then she walked back out again without a complaint. Wow! 4. There are lots activities that we enjoy that our daughter does, too. At local farmers markets we admire the local vegetables and artisanal breads while she ogles the fruit and fresh donuts. 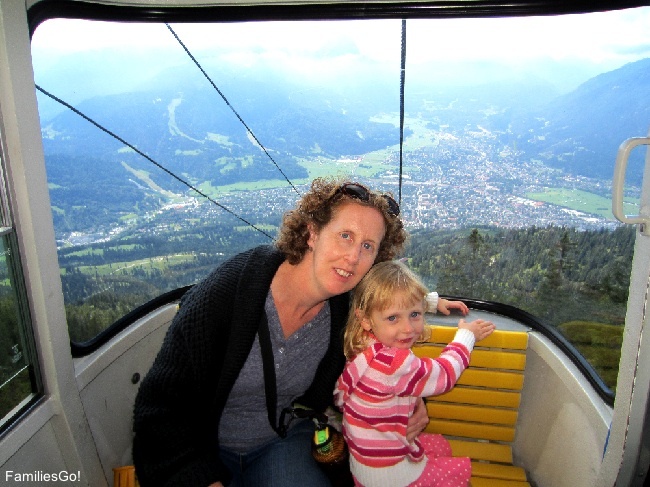 In Germany we all loved taking gondola rides into the Bavarian alps and exploring King Ludwig’s castles. Art museums often have family tours that engage both kids and parents surprisingly well. Art Treks at the Met in New York are great. 5. Some of the kids activities we most dreaded have turned out to be fun. We went to a ski lodge this winter that had an indoor water park. These rank second only to Chuck E. Cheese on my list of dreaded child entertainment. She was too small for the slides, so we alternated between swimming in an indoor-outdoor hot tub and bobbing around in a wave pool—not a bad way to spend a winter afternoon. 6. Kids get bigger. As our daughter has gotten older she’s gotten less portable and more vocal in her preferences. She no longer falls asleep in the stroller (allowing us to grab an afternoon beer). But can stay up later, sit in a restaurant for a reasonable length of time, go to art museums and amuse herself fairly well on car trips. While she would be happy to go to the beach or to Disney World on every vacation, she gamely throws herself into city, camping and ski vacations, too. One way or another we’ve managed to enjoy all our family vacations and haven’t had to settle for surviving any of them. I hope you do, too. Eileen Gunn (WSC ’93) is putting her journalism degree to use as the founder of FamiliesGo!.